March Daring Cooks – Risotto | eat. play. sleep. 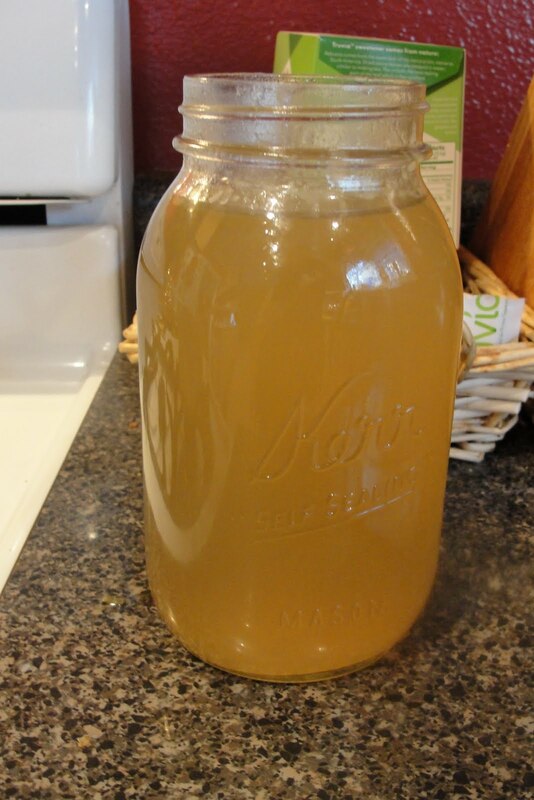 First, we had to make a basic chicken stock. I roasted two chickens and used the carcasses to make the stock. I added a bunch of leeks, some cremini mushrooms, carrot, celery, and some black peppercorns. I canned the stock and now have enough to last quite a while! Then it was risotto time! I made the base with by sauteing onions in a bit of olive oil, then deglazing with white wine. I added some canelori rice and added stock that had been heating up in a separate pan a ladle at a time. 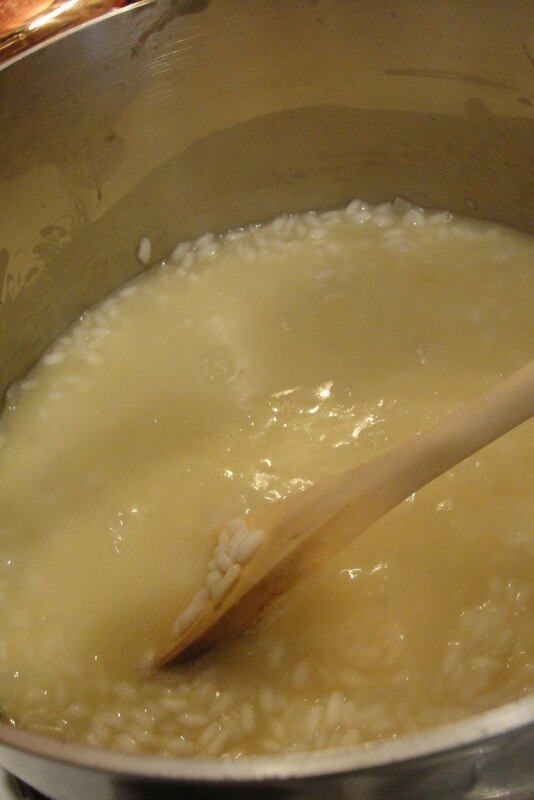 I waited until each ladle of stock had been absorbed before I added another – this is the key to a risotto that isn’t gloppy. I finished with some lemon zest, salt and pepper, really nice young baby spinach. 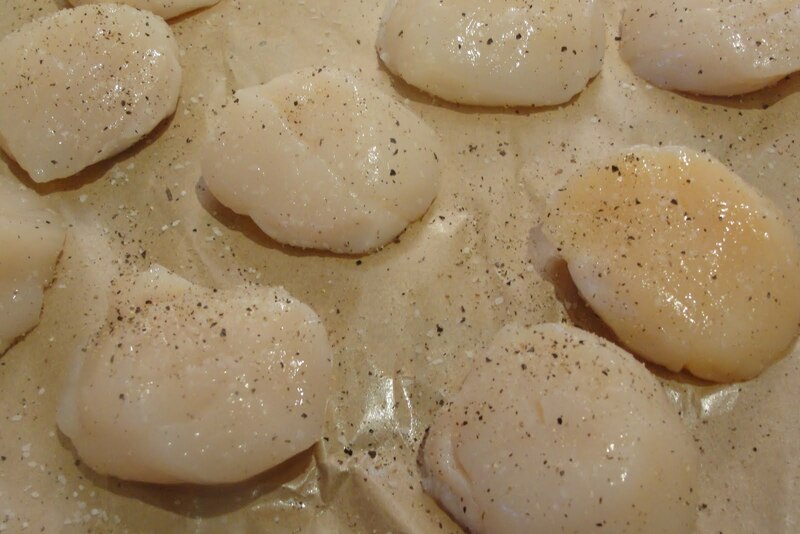 To serve, I seared some fresh diver scallops and then gave them a little spray of lemon juice. YUM! Check out these lovely scallops. They smelled amazing and were so yummy and sweet! They came from Whole Foods (also known in our house as Whole Paycheck) and cost an arm and a leg. But soooooo worth it! Lovely, fresh, comforting, and family approved! GORGEOUS job, Allie. 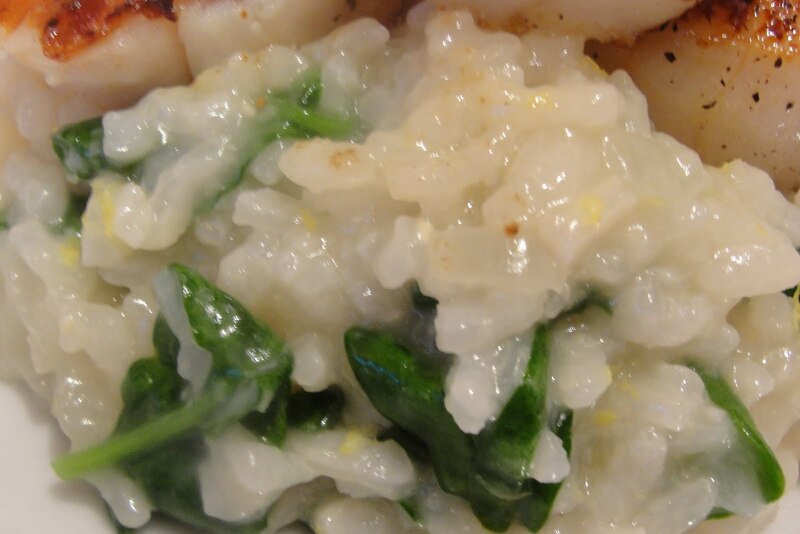 Your photos are fantastic, your stock looks delicious, and the risotto looks amazing! Wow. Good job! The stock and the risotto look great! 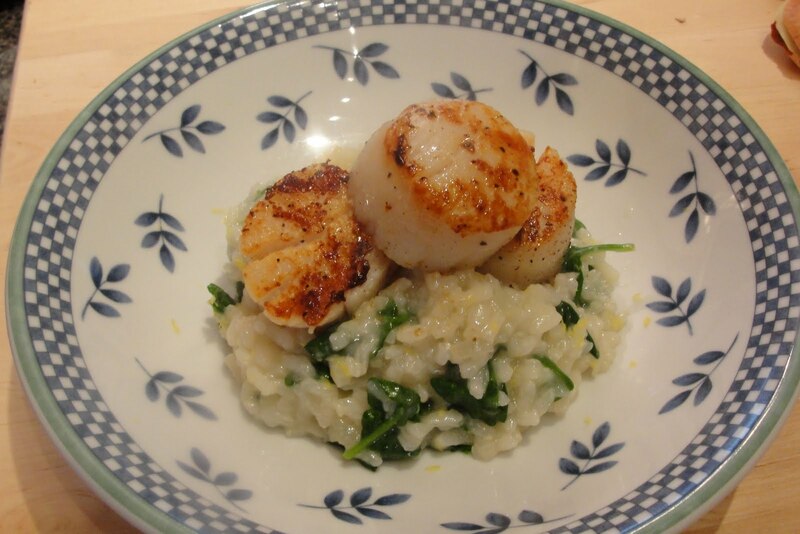 That looks fantastic, I love anything with spinach, shame my young ones will not go near it.. means I tend to have it on the side rather than in things..
the scallops look so juicy and tasty on top of your risotto! yummy! I love that picture of the seared scallops (and the price is amazing!) and great to hear that you liked it so much and that it was worth it. Cheers from Audax in Sydney Australia. Lovely photos also. Oh, I really love your photos! 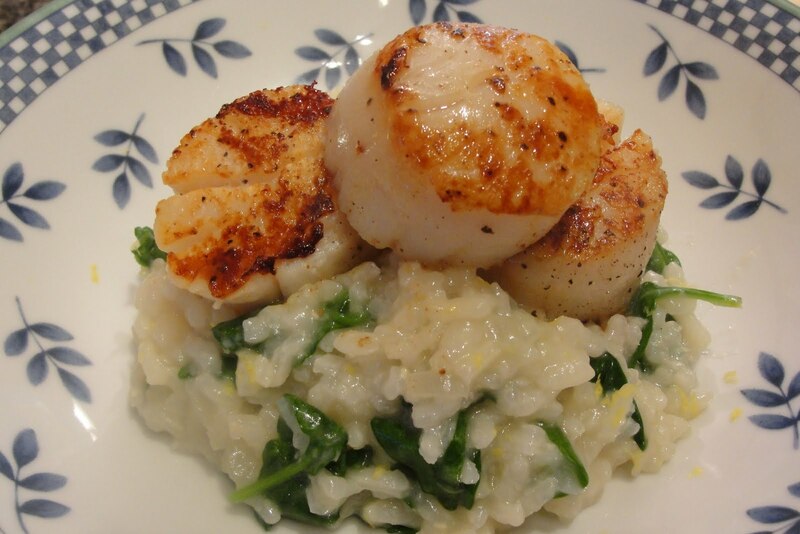 The combination of a fresh spinach risotto with those beautifully seared scallops must have been wonderful! 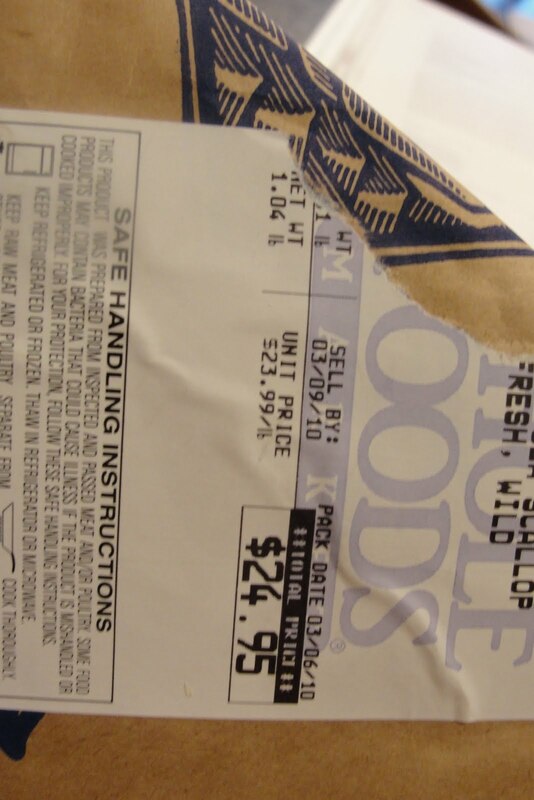 LOL, whole paycheck scallops. LOVE it!